I believe it is fair to say that Gbenga Arokoyo, the central defender of Kwara United FC, is one of the revelations of the Nigeria Premier League 2010-2011. Arokoyo made his debut for Kwara United FC in the so-called “Super Four”, a pre-season tournament that was played in August 2010. 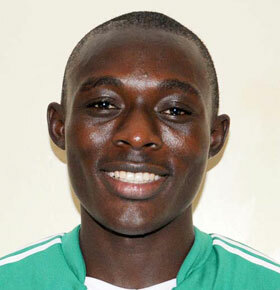 Arokoyo had recently been signed from the Kwara Football Academy, based in the city of Ilorin. Arokoyo has several times praised the well-structured academy and its importance for his development as a player. It took Arokoyo few matches to establish himself in the heart of the Kwara United FC defence. On 11.12.2010, in the match against JUTH FC, Arokoyo scored his first and so far only goal in the Nigeria Premier League. Arokoyo was named in the “Team of the week” after the match, not only because of the goal but also because he controlled the dangerous JUTH attacker James Amankwe. In January / February 2011, Arokoyo was apparently training with FK Qäbälä, a top division side from Azerbaijan. FK Qäbälä is managed by England and Arsenal legend Tony Adams, who should be able to spot a gifted central defender. The trial at the Azeri club had to be a rather short one as Arokoyo played for Kwara United FC both 22.01.2011 and 05.02.2011. Unfortunately it is difficult to find information about the trials in Azeri newspapers or at Azeri websites. On 05.02.2011, against Enyimba FC, Arokoyo was sent off for the first time in the Nigeria Premier League. While Arokoyo was training with the Azeri side, he apparently missed training sessions with the Nigeria B national football team. It was reportedly Samson Siasia, the coach of the Nigeria national football team, who wanted the youngster to attend these sessions. While attending the trials, Nigerian journalists described Arokoyo as “one of the best central defenders in the Nigeria Premier League”. A few weeks ago, Arokoyo was part of the Nigeria U-20 national football team who was on a two-match tour in Libya. Former key player for the Super Eagles, Garba Lawal, apparently said the following to MTN Football: “The whole team played well with the Kwara United central defender (Gbenga Arokoyo) really standing out”. It seems highly likely that Arokoyo will star for the Nigeria U-20 national football team in the Orange African Youth Championship to be played in Libya in March 2011. The date of birth of Arokoyo is unknown. In June 2010, Swedish newspaper Dagens Nyheter made a report about the Kwara Football Academy. Arokoyo was interviewed and was described as a“17 year old”. Arokoyo must therefore be born in 1992 or 1993. In the report, Arokoyo was described as a very polite young man who originally wanted to be a doctor. His family could not pay for his education and he chose to focus on football. He described the day he was chosen for the academy as the best day of his life. According to the report, Arokoyo was one of the biggest stars of the academy and he had apparently been attending trials in the Netherlands and Germany. He was also described as a very skillful player, who could also play as a midfielder. Hi! Arokoyo I know this young player, but this picture is new to me. Azerbayjan is aslo a good place for African players. Their national team even have one Nigerian, defender Usim Nduka of AZAL FC. If you follow nigerian and westafrican leagues, pls inform the people from where Nigerian players appear in Finland, Moldova and Israeli leagues.